I am very well aware of what’s happening to our coral reefs. Coral should not be taken to make any type of objects…in my opinion. Anyway, I love a good hunt. I scout out thrift shops and other places looking for treasures. I had gone to a thrift shop and found a coral and pearl necklace that I could tell from the style it was 1950’s. This was a long necklace that you wrap around your neck a few times. The first thing is…ask the price. Make a counter offer, which on rare occasions is accepted. Most thrift shops today do online auction. If you want it, do a get it now. Now I know the price. Next step is to make sure the beads are not ruined from perfume. Perfume can do a number on pearls and coral such as giving each a dull appearance. After studying the beads, they were fine. Next step: Count the beads and divide into the final price. Bummer…I hate this part. I have to know what each bead is going to cost. The phone has a calculator. Yay! Bonus: the clasp is a carved rose. I put this away for now. Obviously I bought the necklace. Had Hubs double check the math. He knows I get in trouble. I can see beads in my head but not numbers. After I take apart this old necklace, I clean all the beads with a soft cloth. 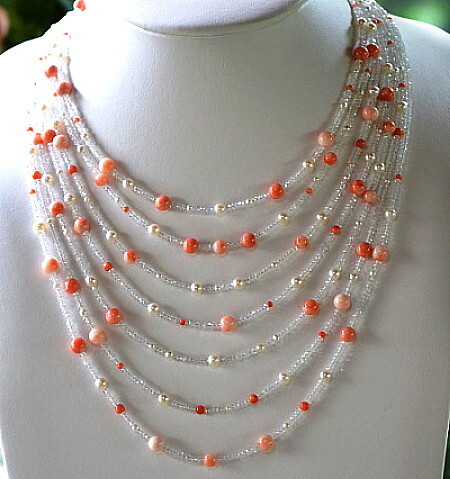 I made “Shimmering Corals.” I wanted the necklace to have sparkle. I used White Topaz. 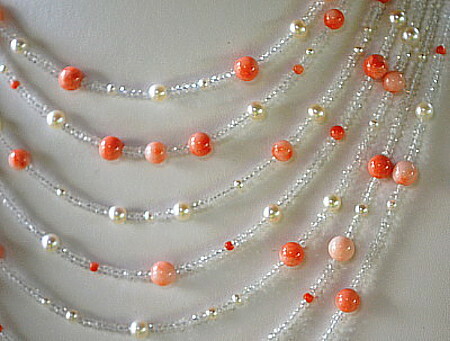 You can see I used the corals and the pearls. In hindsight, I should have taken a photograph of the old necklace. I made what I thought would be nice for different age groups. Something lighter looking. Best of all, I recycled.